Selbuvotter! How much do I love this book? 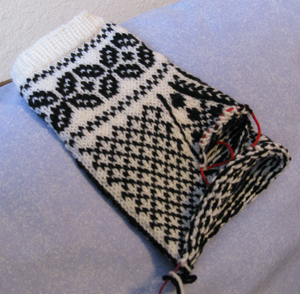 It wasn't easy to choose the gloves I wanted to make first, almost every pattern in it appeals to me. One more finger and then I get to do it all over again. 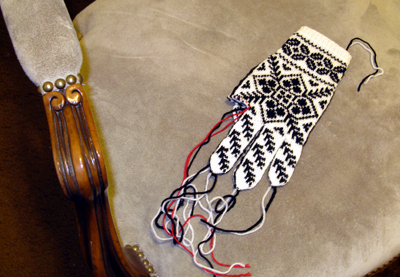 This style of gloves would look pretty in a light delicate blue on white for a subtle softer look. I decided to use the traditional black and white first but I'll probably explore more colors on the next pair. It's a good idea to buy the 2nd edition, but errata can be found on the website for the 1st printing. When I start a new pattern the first thing I do is turn on the scanner, for a few practical reasons. 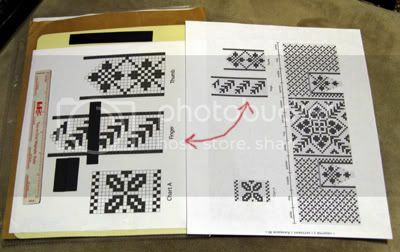 I don't want to mark up the original pattern, and if I misplace the copy the original is still here. Any section of the chart can be enlarged, or broken up into manageable pieces, before it's printed. A print-out and a magnet board can be slipped inside a sheet protector (see below), which I can't do if the original chart is printed in a book. On the right is a scan of the original page, those three small charts were enlarged so they'd be easier to see without specs on. Scan charts in greyscale (instead of black and white) so they look better printed out. 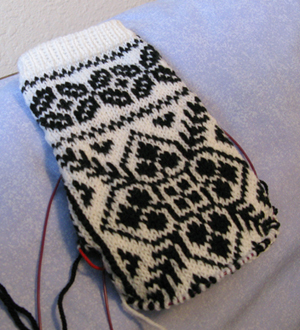 I also turned the hand chart into two charts: one for the left glove and one for the right. Doing this allowed me to enlarge the hand charts so they filled up the entire page and they're easier to follow as well. The magnet board can be purchased at most craft stores in the embroidery section, give it a try if post-it notes don't work for you. My board came with the magnets shown, including the handy ruler magnet.